n 1950, Celia Franca received a letter that would change her life – and change the cultural landscape of Canada. The talented young dancer had been performing with London's world-renowned Sadler's Wells Ballet, and was making her mark as a choreographer for stage and television in post-war Britain. 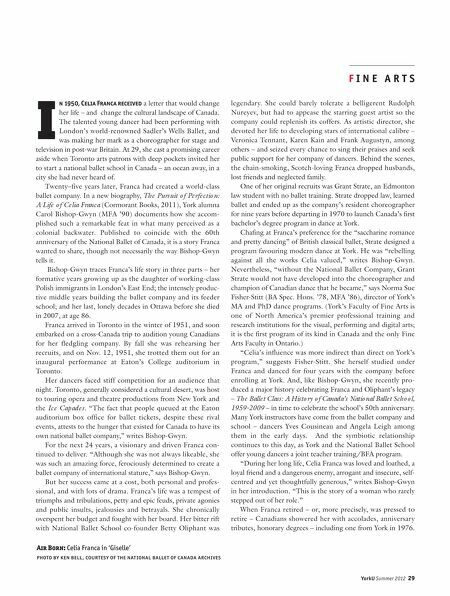 At 29, she cast a promising career aside when Toronto arts patrons with deep pockets invited her to start a national ballet school in Canada – an ocean away, in a city she had never heard of. Twenty–five years later, Franca had created a world-class ballet company. In a new biography, The Pursuit of Perfection: A Life of Celia Franca (Cormorant Books, 2011), York alumna Carol Bishop-Gwyn (MFA '90) documents how she accom- plished such a remarkable feat in what many perceived as a colonial backwater. 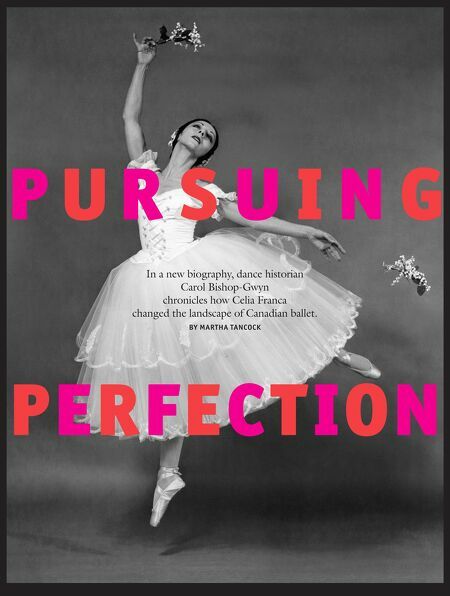 Published to coincide with the 60th anniversary of the National Ballet of Canada, it is a story Franca wanted to share, though not necessarily the way Bishop-Gwyn tells it. I Bishop-Gwyn traces Franca's life story in three parts – her formative years growing up as the daughter of working-class Polish immigrants in London's East End; the intensely produc- tive middle years building the ballet company and its feeder school; and her last, lonely decades in Ottawa before she died in 2007, at age 86. Franca arrived in Toronto in the winter of 1951, and soon embarked on a cross-Canada trip to audition young Canadians for her fledgling company. By fall she was rehearsing her recruits, and on Nov. 12, 1951, she trotted them out for an inaugural performance at Eaton's College auditorium in Toronto. Her dancers faced stiff competition for an audience that night. Toronto, generally considered a cultural desert, was host to touring opera and theatre productions from New York and the Ice Capades. "The fact that people queued at the Eaton auditorium box office for ballet tickets, despite these rival events, attests to the hunger that existed for Canada to have its own national ballet company," writes Bishop-Gwyn. For the next 24 years, a visionary and driven Franca con- tinued to deliver. "Although she was not always likeable, she was such an amazing force, ferociously determined to create a ballet company of international stature," says Bishop-Gwyn. But her success came at a cost, both personal and profes- sional, and with lots of drama. Franca's life was a tempest of triumphs and tribulations, petty and epic feuds, private agonies and public insults, jealousies and betrayals. She chronically overspent her budget and fought with her board. Her bitter rift with National Ballet School co-founder Betty Oliphant was Air Born: Celia Franca in 'Giselle' photo by ken bell, courtesy of the national ballet of canada archives YorkU Summer 2012 29 F INE AR T S legendary. She could barely tolerate a belligerent Rudolph Nureyev, but had to appease the starring guest artist so the company could replenish its coffers. As artistic director, she devoted her life to developing stars of international calibre – Veronica Tennant, Karen Kain and Frank Augustyn, among others – and seized every chance to sing their praises and seek public support for her company of dancers. Behind the scenes, the chain-smoking, Scotch-loving Franca dropped husbands, lost friends and neglected family. One of her original recruits was Grant Strate, an Edmonton law student with no ballet training. Strate dropped law, learned ballet and ended up as the company's resident choreographer for nine years before departing in 1970 to launch Canada's first bachelor's degree program in dance at York. Chafing at Franca's preference for the "saccharine romance and pretty dancing" of British classical ballet, Strate designed a program favouring modern dance at York. He was "rebelling against all the works Celia valued," writes Bishop-Gwyn. Never theless, "without the National Ballet Company, Grant Strate would not have developed into the choreographer and champion of Canadian dance that he became," says Norma Sue Fisher-Stitt (BA Spec. Hons. '78, MFA '86), director of York's MA and PhD dance programs. (York's Faculty of Fine Arts is one of North America's premier professional training and research institutions for the visual, performing and digital arts; it is the first program of its kind in Canada and the only Fine Arts Faculty in Ontario.) "Celia's influence was more indirect than direct on York's program," suggests Fisher-Stitt. She herself studied under Franca and danced for four years with the company before enrolling at York. And, like Bishop-Gwyn, she recently pro- duced a major history celebrating Franca and Oliphant's legacy – The Ballet Class: A Histo ry o f Canada's National Ballet Scho o l, 1959-2009 – in time to celebrate the school's 50th anniversary. Many York instructors have come from the ballet company and school – dancers Yves Cousineau and Angela Leigh among them in the early days. And the symbiotic relationship continues to this day, as York and the National Ballet School offer young dancers a joint teacher training/BFA program. "During her long life, Celia Franca was loved and loathed, a loyal friend and a dangerous enemy, arrogant and insecure, self- centred and yet thoughtfully generous," writes Bishop-Gwyn in her introduction. "This is the story of a woman who rarely stepped out of her role." When Franca retired – or, more precisely, was pressed to retire – Canadians showered her with accolades, anniversary tributes, honorary degrees – including one from York in 1976.